Design Thinking students in two different groups jot down ideas on a whiteboard. 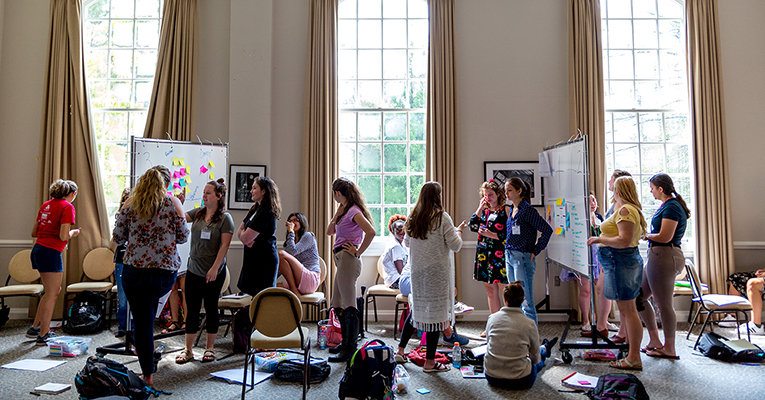 CORE 110: Design Thinking is the first class in the College’s Leadership Core Curriculum. 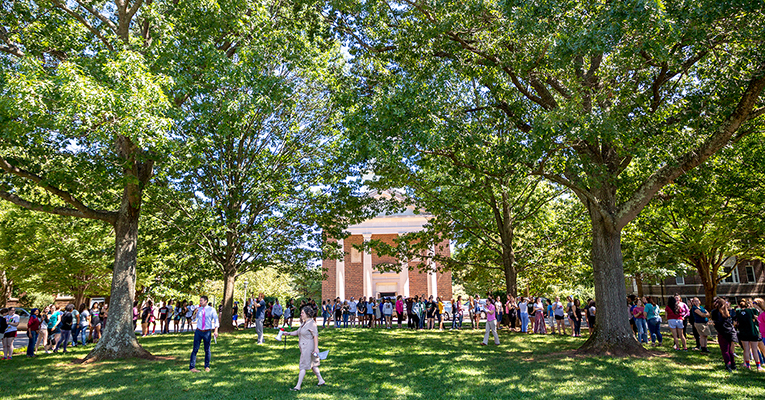 It was team-taught by four faculty members: Josh Harris, music; Christopher Penfield, philosophy; Jessica Salvatore, psychology; and Kaelyn Leake, engineering. One reason it’s the first course in the core is because it can be applied to so many different fields. Kaelyn Leake, assistant professor of engineering, says that although there’s already an engineering design process, design thinking can be complementary and both processes are based on similar principles. 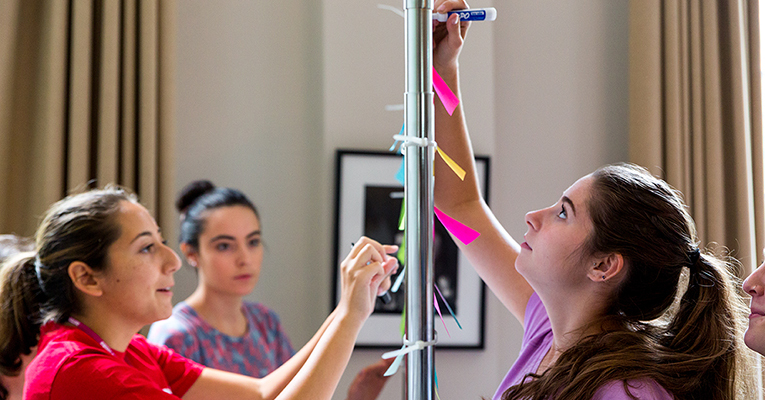 “I think anyone who truly learns design thinking will see their field in it,” she says. Design Thinking students work in groups on solving a problem during the fall 2018 class. Perhaps the most defining part of design thinking is that it is an iterative process. You talk to someone and empathize with them. You define the problem. You come up with ideas for solving that problem. You build a prototype of that solution and then you test it. But the process doesn’t end there and it’s not linear. Sometimes you think you’ve defined the problem, but during the testing phase, you discover some un-thought-of aspect that changes the way you think. Sometimes you test something and it doesn’t work, so you have to come up with new ideas and develop a new prototype. Sometimes your idea works great, but during the process, you discover a different problem you want to solve. To be sure, design thinking has its skeptics. Salvatore was a skeptic until she took the Stanford course. Penfield notes that critics sometimes say that “design thinking doesn’t involve a moment of critique,” but he argues that critique is an inherent part of the iterative process. “It’s important to know when, in the creative process, to apply that critique,” he says. 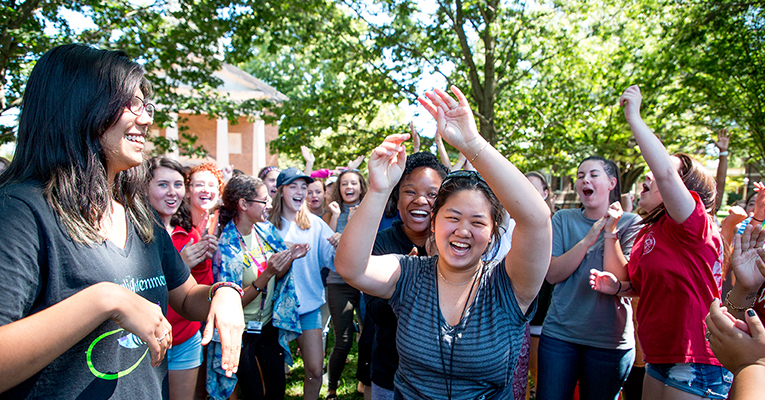 Design Thinking students have fun during an outdoor exercise in the Quad. The class is pass/fail, and as a result, doesn’t have an impact on a student’s GPA, but that’s by design, says Lynn Rainville, dean of the College. “Solving problems is a process that by definition involves failure,” she says. “We don’t want our students to be afraid of that or to be concerned that failing to solve an assigned problem will have a negative impact on their grade. We want them to fail — and we want them to learn from those failures.” In fact, taking risks and learning from failures is one of the primary goals of the class. Students in the class work in teams. Salvatore says the notion of teams — not just “groups” — is important. For students, group work can be an annoyance, but Salvatore explained that the projects they were doing could not be actually done by an individual — she used the example of raising a barn: even if she wanted to, she could not build a barn by herself, just like the projects the students were working on in the class. Unlike a group, a team is a collection of people focused on a common goal, and everyone on the team has a sense of identity and a shared mission. During the course, students worked in several teams, and some of the students acknowledged that they didn’t always get along with other team members, but that, too, is a learning experience in itself. Learning to work with others wasn’t the only skill the students learned. Because the first step in the process is empathy, students had to learn to talk to someone and really listen to what they had to say. While the students were practicing empathy, they were also learning interviewing and listening skills — and that’s before they’d solved any problems at all. CORE 110 gives students an opportunity to learn these skills so that they’ll be prepared to go into the workforce and collaborate with people of various skills and knowledge. And they’ll be able to work effectively with those people and come up with truly innovative solutions. The term “design thinking” was probably coined in the 1960s. IDEO, perhaps the company best known for developing consumer products using design thinking tools, was founded in 1991. Stanford University launched the Hasso Plattner Institute of Design, better known as the d.school, in 2005. It’s a question that gets asked regularly over kitchen tables when kids are doing their homework: “Why do I have to learn this?” And it was one obstacle the faculty of CORE 110 had to overcome with their own students, so one of the first things the students did was to look at some case studies about how design thinking had led to innovative solutions. One such case study was the story of Doug Dietz, a designer for high-tech medical imaging systems for GE Healthcare. Dietz noticed that though his machines were technological marvels, the kids were so scared to get in them that they had to be sedated. Dietz realized there had to be a better way. He took Stanford’s course on design thinking and learned skills that helped him understand a human-centered approach to design. He had to find a way to make the machines less scary. One of the prototypes he designed turned the MRI machine into a pirate ship and after the voyage was complete, there was a small bit of “treasure” waiting for the child in a pirate chest. Children were now less scared and the hospital had less need for anesthesiologists. Everybody won. Some critics of design thinking argue that anyone could come up with these simple-seeming solutions; it doesn’t require a complicated process. But the truth is, before Dietz, nobody had come up with a solution to this particular problem. Simple doesn’t always mean easy or obvious.